Although I love my cookbooks and the Internet, I still get a few magazines. My all-time favorite was Gourmet (moment of silence for its passing), which I subscribed to from about 1978 until it ceased publication. 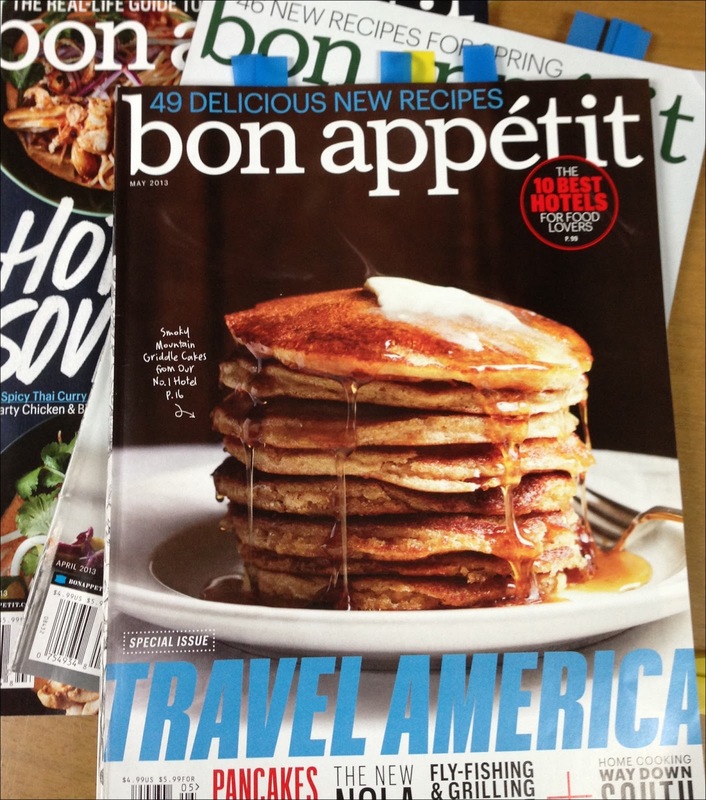 I've gotten Bon Appetit for the same number of years, and I look forward to each issue. I know it's going to sound corny, but I have a routine when I get a new issue of a cooking magazine in the mail. I like to sit down with a cup of coffee or tea and a pack of sticky flags and mark all the recipes that look good to me. (See the markers sticking out of the top of the magazines in the photo?). Then I try to make one or two of those dishes. I thought I'd share some of my adventures with Bon Appetit over the last three months. I am not a very good food photographer (yes, I need to work on that), so I've used the photos found on the magazine's website. 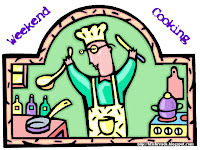 All the dishes I tried are found there; follow the links for the recipes. The cover of the March issue is soups, and I'm one of those people who could eat soup almost every single day. I had marked a few to try, like Chicken and Biscuits, but for some reason I never made any of them. Well, I know the reason: I'm insanely busy in March and don't do much cooking. What I did make was a wonderful Beer-Marinated Pork Tenderloin with Red Cabbage. I made this with boneless pork chops (because that's what was in the freezer) and instead of baking it in the oven, I grilled it. The cabbage is a side dish and was yummy. The April cover is the one you see in the photo above. Doesn't that stack of pancakes look awesome? I didn't make them, but boy were they tempting. 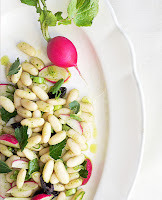 Instead I celebrated spring with a flavorful White Bean and Radish Salad. We had it as a side dish with grilled cheese sandwiches and then ate it for lunch during the week. This is a definite keeper and would be terrific at a summer cookout or on a buffet. For my husband's birthday, I made the Strip Steak with Onion Marmalade. This was good, but I didn't use their suggested seasoning, which I thought was going to be way too salty. The butter baste (hey, it was a birthday!) didn't really add anything to the flavor, so wouldn't do that again. We liked the onion marmalade, though, and put it in the grilled cheese sandwiches I mentioned earlier. Now that was an wonderful discovery. May's cover featured a gigantic fried-chicken sandwich. I'm not that interested in fried food, but I did find a few fabulous recipes. Have you ever made a savory bread pudding? If not, you should give them a try. They are the ultimate comfort food. 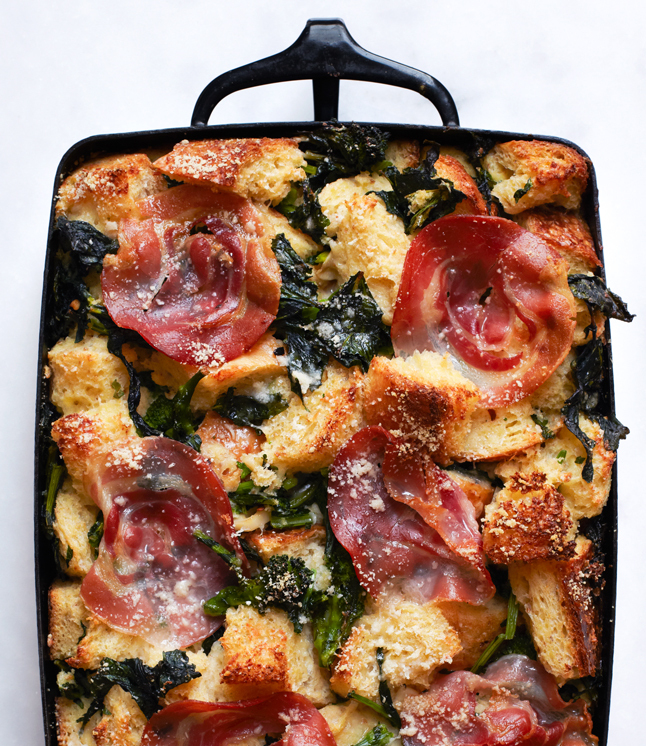 We loved the Parmesan Bread Pudding with Broccoli Rabe and Pancetta so much, we were tempted to eat the whole pan in one sitting. Really, it was that good. I used regular bacon because I had it in the house, but other than that, I pretty much followed the directions. We also really liked the Steak and Soba Stir-Fry, although I'm not sure if I really needed a recipe for such a simple dish. Another winner was the Brown Rice and Beans with Ginger Chile Salsa, served with avocado and Cotija cheese. This stood on its own for dinner but would go well with tacos or enchiladas if you wanted to add meat to your meal. 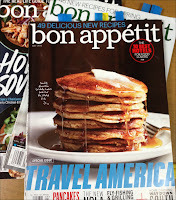 I still have a lot more recipes to try from these issues of Bon Appetit. Sometime this summer, I'll reassess the likelihood that I'm really going to make any of the others, and cut out and file the ones that still look good. Photo credits: the three food photos are from Bon Appetit. I got Bon Appetit for years, and finally decided the recipes were a bit too complex for the life of a mom. But these look so tasty -- and my kids are so grown up -- that it might be time to reassess! I used to really enjoy Bon Appetit but the past couple years they've really pared down the publication and have fewer pictures with their recipes. Because of this I decided to cancel my subscription. I just wasn't feelin' the love anymore. Then again, I think I am looking for a reason to cancel magazine subscriptions lately. I just don't have time to read them. They pile up on my kitchen table and have to wait three months before I have the inclination to sit down and read them. I recently starting getting it..it must have been a great deal...and I am not quite sure of my opinion yet. it might be telling that I have not yet made a recipe from it yet, but the pics are very pretty. I love the idea of trying out a couple of the recipes from each month's magazine. My husband and I tend to get into ruts with cooking these days and it would be nice to shake things up. I quit getting magazines like that because I never tried any of the recipes. You're so smart to mark the ones that look good to you! That savory bread pudding looks so tempting, I'd like to try that one. I do the same thing with post-it flags! The only cooking magazine I still receive is Taste of Home (a b-day present from my mother), but sometimes buy single issues of others from the supermarket. It might be time to give Bon Appetite another chance. Sitting down with each issue and a pad of Post-Its is such a simple idea, yet so brilliant! I don't subscribe to any cooking magazines for the reasons others cite, but when I retire, it may be something I go back to. I guess they'll be 100% electronic by then, but oh well. 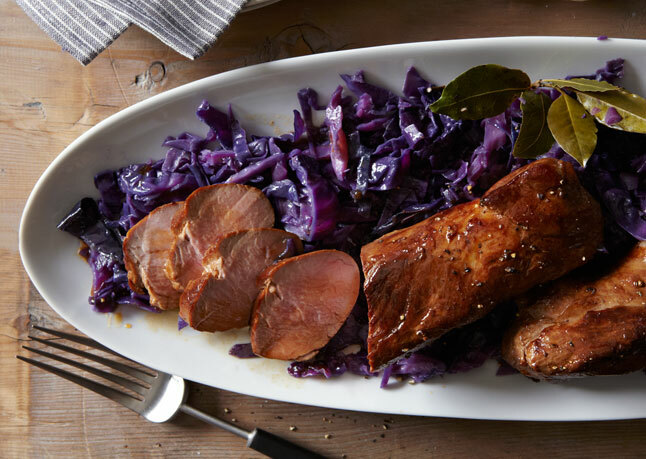 OMG can you believe I actually just made that beer marinated pork roast last week? I think I found the recipe on the Internet but it is the same one! It was delicious too. I do miss my Gourmet mag. I have been following Weekend Cooking for a while but this is the first time I submitted a blog post. I also love magazines for cooking - I really enjoy the BBC Good Food magazine and BBC Olive. Their websites are great as well. I haven't read Bon Appetit in years. All the recipes sound yummy, and marking the ones you like is a great idea! I have to admit that I have never bought a magazine of any description, ever! My mother used to have regular subscriptions to many of the women's magazines and my mother-in-law still does, but they have never interested me in the slightest. I suppose it is mostly that I can't be doing with the amount of space which is given over to advertising and which, if all of it was removed, would actualy only reveal true content of a meagre few pages. Also, with the cost of the remaining few pages being quite high, it makes more sense to me to go out and by a decent quality book!! I do like the the sound of the 'Parmesan Bread Pudding ..', my kind of meal, although hubbie would probably have a fit if I dished it up for him. He love cheese off the block, but can't stand cooked cheese. I think it is more the smeel of the cheese baking, rather than the finished dish! All these recipes look great! That white been and radish salad is going on my dinner table this week! Bon Appetit was always my favorite. But I finally stopped all my food magazine subscriptions because I was buried in magazines. I'll have to give the bread pudding recipe a shot. It looks and sounds amazing. 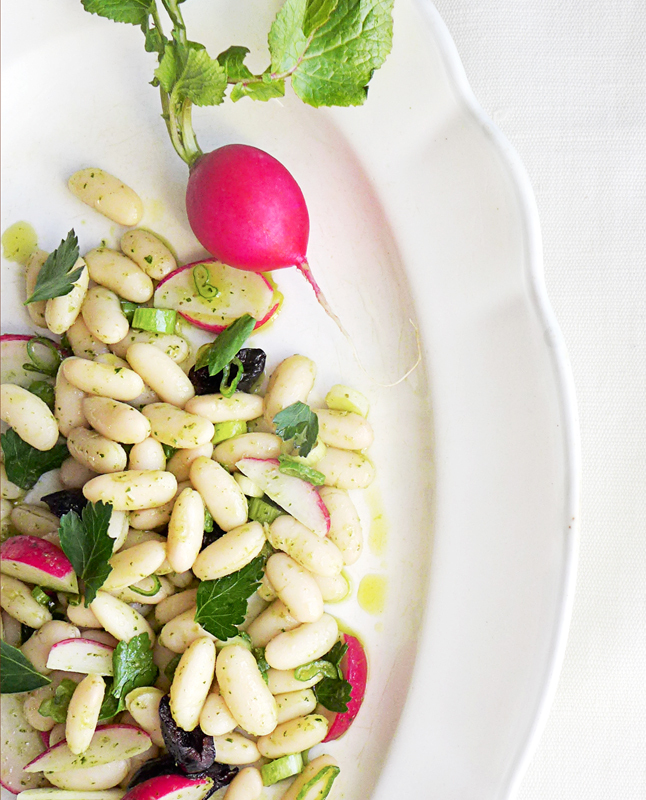 Also the white bean salad--I love bean salads in the summer! I've never tried Bon Appetit. My favorite cooking magazine, hands down, is Food & Wine. I've made dozens and dozens of recipes from it and have yet to get a bad one. I highly recommend it for foodies. I have to admit we've always thought of Bon Appetit as a poor sub for Gourmet, but I do think the recipes are pretty solid. With a hectic winter/spring my issues have been languishing in piles on the coffee table, but I love the sound of the bread pudding so will check that one out! We also get Food & Wine which often has good offerings. I still miss Gourmet, though. LOL! I need a recipe for every dish.